Nail bed injuries are the result of direct trauma. The nail itself may be avulsed as part of the injury. The usual mechanism of injury involves crushing. Care must be taken to exclude foreign bodies. This injuries are at risk for osteomyelitis if not cared for properly. A AP radiograph of the first digit. 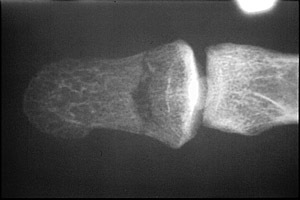 This reveals a transverse fracture through the distal phalanx of digit one. 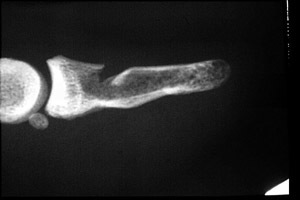 B Lateral radiograph of the first digit. There is a depressed fracture of the distal phalanx.